This quote makes me think of garage sales. The quote is in reference to the iPad. Apparently it uses another metal, cobalt. Because of the popularity of the iPad, cobalt is also now popular and expensive. You and I are trying to save money on everyday purchases. 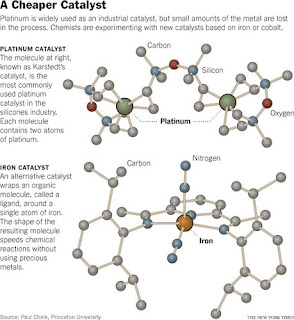 But scientists like Dr. Chirik are trying to save thousands by making iron act like platinum. Not platinum, the bling-bling word, but the metal that costs apparently $22,000 per pound. As opposed to iron that is only $0.50 per pound. If only we could get those savings at the store! While Martin's is no Publix when it comes to deals, once in a while I do a double-take and am impressed by their deals. Sure, gone are the 19cent-a-pound turkeys on sale for Thanksgiving. But this week, Martin's has their Giant brand turkeys $.39/lb when you make a $25 purchase. PLUS, this week's ad in the Sunday paper had a coupon for 20cents off gas when you buy a turkey. I found a turkey for $5.30 plus I got 20 cents off gas. For a full tank, that means saving $3.20. That makes the turkey $2.10! Nearly free in my book! Now if I can only make the turkey look like the picture then that would be a real impressive saving. Last time, oh, it was a long time ago. I posted a couple of things from California. We stayed with my parents for a while just blown away by the awesomeness of California. Now more than six months later, we are here in Virginia! Enjoying the beautiful four seasons. And all completely new grocery stores: Kroger, Martins, Food Lion. I thought for a long time that the days of 90% savings was long gone. But until recently, I think there are some great deals left to talk about after all. With Thanksgiving next week, they should really start rolling in. So, this new journey, with it's learning curve, might take us on an adventure in savings yet!